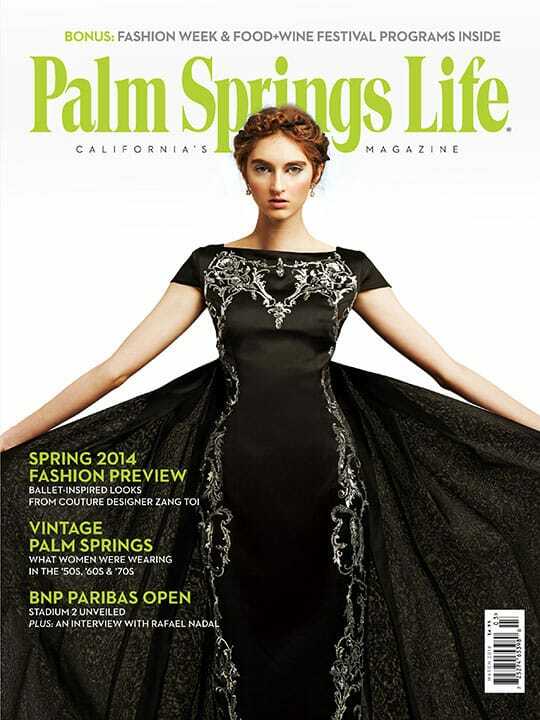 ON THE COVER – Zang Toi’s black silk satin gala gown with platinum beaded detail and empire-waist organza overlay. Photography by Jiro Schneider. Ballet-inspired looks from international designer Zang Toi’s Spring 2014 collection have an ethereal aesthetic that radiates elegance and luxury. By Jessica Taylor Tudzin. Photography by Dan Chavkin. A Palm Springs couple goes with the flow after finding the original blueprints to their house. The Indian Wells Tennis Garden expansion promises continued excellence for the 400,000-plus fans expected to attend the prestigious tournament. By Susan Stein. 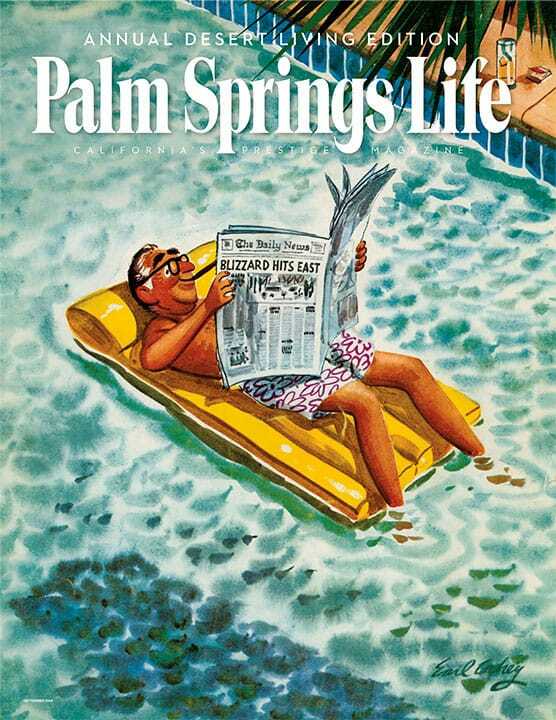 Photography from the Palm Springs Life archives. 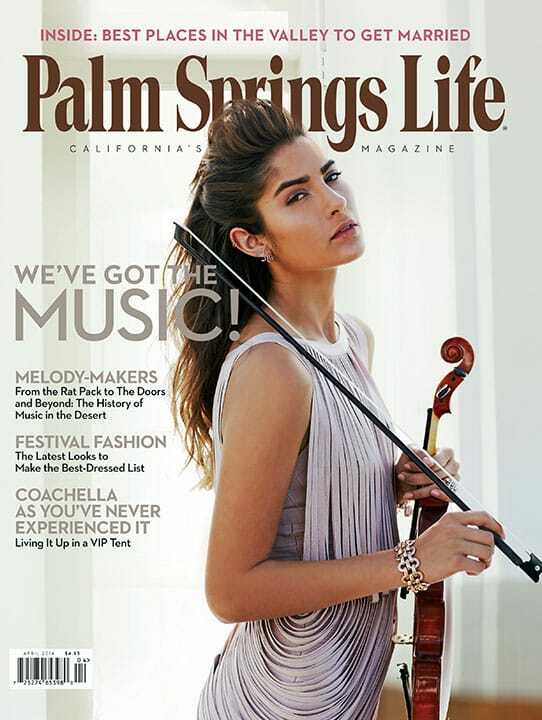 This month – in the spirit of Fashion Week El Paseo — we take a fun look at the styles featured in the pages of vintage Palm Springs Life magazines. This is a month filled with great fashion, food, libation, and tennis. Terry Moore consigns a chevron-style collar necklace — a gift from actor Cary Grant — to Estate Jewelry Collection. French footwear designer Christian Louboutin, renowned for his signature red sole, makes his debut in Palm Desert with a vibrant and colorful spring collection. From the most iconic dresses of the 20th century to the history of men’s custom tailoring, these eight collectors books are a must for every sartorial connoisseur. Vintage clothing aficionado Willian Miller curates an upscale collection for his Uptown boutique. A historic Movie Colony estate, formerly owned by Hollywood producer Darryl Zanuck, boasts the ideal setting for entertaining in true Palm Springs style. Increase in net worth bodes well for the Coachella Valley. Retrograde Mars makes this a time to review and realign.